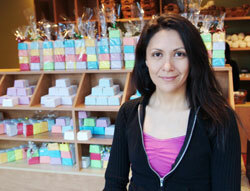 Michaelee Lazore has brought her line of bath and body products into Quartier Concordia. If you walk into the EV building’s newest retail space, Sequoia, you may see a few familiar faces. Owner Michaelee Lazore graduated from Mechanical Engineering in 1998, and most of her eight staff members are current Concordia students. Opened on Dec. 18, the storefront on Mackay just north of Ste. Catherine is the second retail outlet for Lazore’s line of bath and body creations inspired by Native legends. While selling soaps and bath bombs may seem a stretch for an engineer, Lazore believes her undergraduate education played a key role in her current business. It also helped her recognize that the new location needed some redesign. The cash desk was in the wrong place, creating dead space in the middle of the store. “Customer flow wasn’t what I wanted, so we’re moving things around,” she explained, redrawing the floor plans quickly to show employees where to dismantle and reinstall shelving. Delegating, she said, is the hardest part of running a small business. “I want to do everything myself.” Leaving experienced salespeople at her flagship location in Kahnawake to cover the high volume of holiday sales, Lazore trained a completely new staff downtown. Her business savvy was honed during five years of work at Joe Deom and Associates, an engineering firm in Kahnawake. “It let me see how a small business worked,” she said. And it gave her hands-on experience with budgeting and project management. When she decided to take the leap into her own business venture, those skills helped her apply for loans and funding. “I received two loans from Tewatohnhi’saktha, the local economic development office, and two grants from Aboriginal Business Canada (ABC),” she explained. ABC normally doesn’t give consecutive grants to small businesses but does support expansion. “Our business in Kahnawake is good but limited, because you pretty much have to drive there, so we decided to expand to a downtown location,” and ABC got onboard. Doing business off-reserve has brought new challenges: Lazore now has to deal with taxes and ensure all her signage and labelling are bilingual, but she continues to enjoy the work.